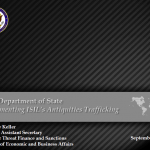 Despite battlefield losses, ISIS continues to operate its own terrorist pseudostate and claims a growing global footprint. At least 34 radical Islamist groups have pledged their allegiance to ISIS. As of this printing, the organization has managed to expand its presence to dozens of countries and territories—in addition to recruiting tens of thousands of fighters from over 120 nations. Most alarmingly, ISIS is driving an unprecedented surge of terror plots against the West and poses a persistent and grave threat to the U.S. homeland. 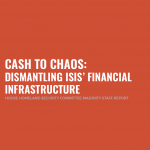 This report highlights that understanding how a terrorist organisation manages its assets is critical to starving the organisation of funds and disrupting their activities in the long term. Terrorist organisations have different needs, depending on whether they are large, small, or simply constituted of a network of seemingly isolated individuals. 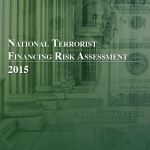 The section on financial management explores the use of funds by terrorist organisations, not only for operational needs but also for propaganda, recruitment and training, and the techniques used to manage these funds, including allocating specialised financial roles. The report finds that authorities need to do further work to identify and target various entities responsible for these functions. 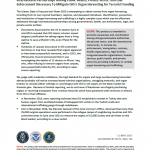 To examine the current money laundering and terrorist financing threats associated with correspondent banking, the Subcommittee selected HSBC as a case study. HSBC is one of the largest financial institutions in the world, with over $2.5 trillion in assets, 89 million customers, 300,000 employees, and 2011 profits of nearly $22 billion. HSBC, whose initials originally stood for Hong Kong Shanghai Banking Corporation, now has operations in over 80 countries, with hundreds of affiliates spanning the globe. Its parent corporation, HSBC Holdings plc, called “HSBC Group,” is headquartered in London, and its Chief Executive Officer is located in Hong Kong. If you’re trying to set up an untraceable shell corporation, your best bet may no no longer be a tax haven or some far away island nation. According to a surprising new study, developed countries like the U.S. and Canada are among the easiest places in the world to set up the kind of anonymous shell corporation that could be used for money laundering, terrorist financing and other nefarious activities. In contrast, known tax havens like the Seychelles, Bahamas and the Cayman Islands all present far more obstacles to the establishment of untraceable corporate structures due to their more stringent compliance with international regulations. In fact, the study found that U.S.-based incorporation services provide one of the easiest routes to establishing an anonymous shell corporation, with only Kenya surpassing the U.S. in terms of noncompliance. 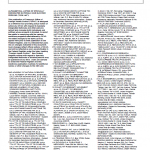 This “previously confidential list of people and organizations found to be involved in laundering money and funding terrorism” was presented by Rossiyskaya Gazeta, the Russian-government owned newspaper. It was originally compiled by the Russian Ministry of Justice. This “previously confidential list of people and organizations found to be involved in laundering money and funding terrorism” was presented by Rossiyskaya Gazeta, the Russian-government owned newspaper. It was originally compiled by the Russian Foreign Ministry. The relationships involving BCCI, the CIA, and members of the United States and foreign intelligence communities have been among the most perplexing aspects of understanding the rise and fall of BCCI. The CIA’s and BCCI’s mutual environments of secrecy have been one obvious obstacle. For many months, the CIA resisted providing information to the Subcommittee about its involvement with and knowledge of BCCI. Moreover, key players who might explain these relationships are unavailable. Some, including former CIA director William Casey, and BCCI customers and Iranian arms dealers Ben Banerjee and Cyrus Hashemi, are dead. Others, including most of BCCI’s key insiders, remain held incommunicado in Abu Dhabi. A basic legal framework for combating money laundering and terrorist financing is in place in the UAE, but that framework needs further strengthening in a number of areas. The AML law needs to be amended to expand the range of predicate offences and to provide greater powers for the financial intelligence unit. The FIU should also increase its own staffing so that it may operate as an autonomous unit, rather than relying on the resources of the Central Bank’s Supervision Department and other regulatory agencies. 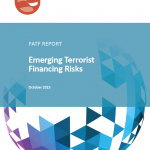 An assessment of the anti-money laundering (AML) and combating the financing of terrorism (CFT) regime of Italy was onducted based on the Forty Recommendations 2003 and the Nine Special Recommendations on Terrorist Financing 2001 of the Financial Action Task Force (FATF) and prepared using the AML/CFT Methodology 2004. The assessment considered the laws, regulations and other materials supplied by the authorities, and information obtained by the assessment team during its mission April 4–20, 2005, and subsequently. The financial sector in Liechtenstein provides primarily wealth-management services, including banking, trust, other fiduciary services, investment management, and life insurance-based products. There has been significant expansion recently in the non-banking areas, particularly investment undertakings and insurance. Approximately 90 percent of Liechtenstein’s financial services business is provided to nonresidents, many attracted to Liechtenstein by the availability of discrete and flexible legal structures, strict bank secrecy, and favorable tax arrangements, within a stable and well-regulated environment. 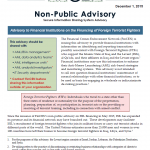 This assessment of observance of the Financial Action Task Force (FATF) Recommendations for anti-money laundering and countering the financing of terrorism (AML/CFT) has been completed as part of an evaluation of Panama’s observance of regulatory standards for the financial sector. Criminal activity in the Czech Republic that generates major sources of illegal proceeds is comparable to criminal activity in other countries in transition. Economic crime (e.g., fraud and asset stripping) that is linked to the privatization process is still a major concern. The authorities also mentioned tax offences as significant crime areas. Organized crime involving drug trafficking and counterfeiting of goods is also active in the Czech Republic with links to the region and Asia. This assessment of the anti-money laundering (AML) and combating the financing of terrorism (CFT) regime of Bermuda is based on the Forty Recommendations 2003 and the Nine Special recommendations on Terrorist Financing 2001 of the Financial Action Task Force (FATF). It was prepared using the AML/CFT assessment Methodology 2004, as updated in June 2006. The assessment team considered all the materials supplied by the authorities, the information obtained on-site during their mission from May 7 to 23, 2007, and other information subsequently provided by the authorities soon after the mission. During the mission, the assessment team met with officials and representatives of all relevant government agencies and the private sector. The international community is concerned with the growing incidence of organized crime, corruption, and terrorism and the debilitating effect these problems have on peace, security and development. A successful strategy to address these international threats necessarily involves measures to address money laundering and the financing of terrorism (ML/FT).